The library at Institute of Technology Carlow has launched its Institutional Repository, an archive for collecting, preserving, and disseminating digital copies of the intellectual output of the Institute. The content is fully and freely available in accordance with copyright holder permissions. Research materials are centrally stored and preserved and the open access repository showcases the Institute’s intellectual output. Open access to the results of research enhances the visibility and the impact of the work, author and the Institute. This Repository forms part of Research@THEA, an open-access repository capturing research output from the Technological Higher Education Association. The Research@THEA repository is available at http://research.thea.ie/. Dr. Mary Delaney, Head of Library and Information Services commented, “The Library is delighted to launch the Institute of Technology Carlow Institutional Repository and we look forward to showcasing research from the Institute with the ongoing growth and development of the Repository”. 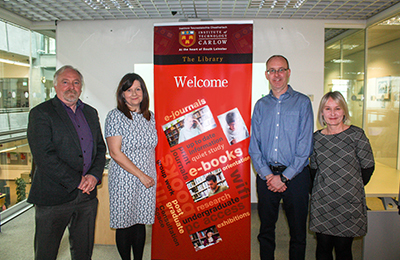 From left: Dr. David Dowling, Head of Faculty of Science; Dr. Mary Delaney, Head of Library and Information Services; Dr. Fintan Bracken, Deputy Librarian and Ms Orla Foley, Senior Library Assistant.